What is The Tommy Taylor Show? 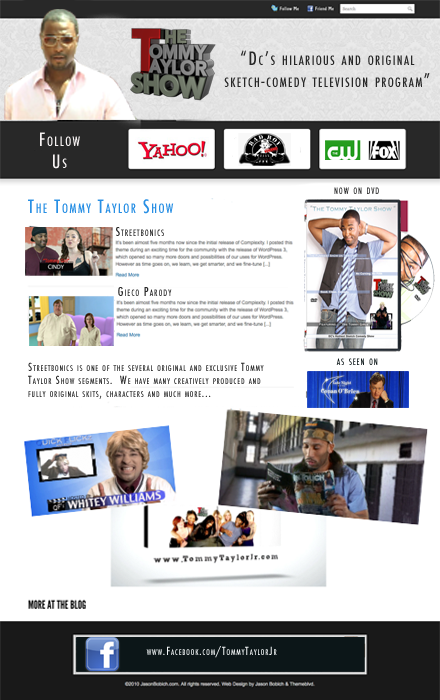 The Tommy Taylor Show is an original and innovative homegrown sketch-comedy television show filmed in-and-around the nations capital Washington, DC. The Tommy Taylor Show currently airs on over 1.3 million homes in DC, MD, and Va. The show features a diverse array of very talented local actors and comedians, and is based on the comedy of actor and comedian Tommy Taylor Jr.
We have partnered with 3rd Side Productions to bring all original music to the show! Led by Rob Sharp, Drew Wesley along with our Music Director, Snuhgie Stocks (who is also a recording artist/musician/producer and plays six instruments) they have brought a fresh new sound to the show. Their experience and full service, state of the art studio has been a great asset to The Tommy Taylor Show! o	Videoifi.com, BadBoyXchange.com (of BadBoy Entertainment), and others. This is not a remake of other comedy shows, but a completely original show with its own unique feel and style.